This is what I hope will be a multiple part series on my lab efforts to study running characteristics and extract what I call 'actionable intelligence'. I hope it will be an enjoyable read. Readers are encouraged to submit findings of flaws to my email. 2. Raise and re-accelerate the center of mass against gravity during each stride. This is a change in potential energy. 3. Move against resistance in the environment by virtue of opposing effect of the medium, such as air resistance, friction or viscosity. This is resistive work. 4. In the legs of larger animals, where both the front and hind legs can be used for braking and accelerating, muscles store elastic energy lost from potential and return some of this energy again on takeoff. It's a convenient way to preserve and recycle effort. So there is a change in elastic energy. Perspective is nice to have. Robert McNeil Alexander, the father of animal locomotion research, stated in the first chapter of his book on locomotion that it takes 15 Joules of energy for a human to increase the sum of kinetic and potential work in the course of a single step. In a landmark paper by Kram and Taylor, metabolic rate of running was hypothesized to be proportional to the cost of supporting the animals' weight and the energy used by each gram of active muscle used in running. Observations established ground contact time, or the time available for each foot to generate this running force on the ground, to be inversely proportional to energy used by active muscle. Volume of active muscle was established to be proportional to body weight across a range of species and body sizes. This spectacularly simple model explains 70-80% of the metabolic cost in both two legged and four legged vertebrates. A graph in that paper revealed the linear relationship of mass specific metabolic cost and ground contact time with speed. It showed the remarkable differences in running cost across a range of species of different sizes. Also shown is the largely speed independent co-efficient c, which is the ratio between mass specific metabolic cost and tc in EQ. 1. An important concept was the influence of body mass on energy cost mainly through rate of force transfer, or the reciprocal of ground contact time tc (1/tc). If I were a rabbit escaping from a big dog straight out of hell, the rate of force generation I would need would be higher (greater 1/tc) than that of the dog because I need faster steps to cover the same ground (due to decreased step length), which involves lesser ground contact time, faster muscle firing and rapid rates of actin-myosin cross bridge cycling. Faster muscle firing means recruiting more energy intensive muscles. Conclusion : the metabolic rate expressed per kg of body weight would be higher for smaller animals than larger ones. This has been proven in animal locomotion research beyond any doubt. Rate of force transfer, 1/tc, was shown to be a power function of running speed. But not on speed alone said a paper by Hoyt et.al. Those researchers displayed an intuitive plot of tc vs relative running speed, defined as running speed divided by leg length and explained that relative speed accounted for 97% of the variability in ground contact time tc. Aerobic capacity, has been a subject of hot debate. Research found that athletes with similar maximal aerobic capacity values don't necessarily perform equally in distance running. Figure below shows two athletes with different running economies but similar VO2-dot-max values. The opposite also seems to be true. Santos-Concejero et.al showed that less efficient RE at velocity eliciting 10-km race pace in North African runners implies that their outstanding performance on the track at international athletic events appears not to be linked to running efficiency. It is possible that less efficient runners might be making up at world events by displaying greater VO2-dot-maxes. The factors for describing running economy itself are complex. Investigating a few out of this bunch of variables give insight but leaving out the rest is problematic. This is why papers like that of Saunders et.al make for good reading for a review of influencing factors of running economy. Researchers have reported a 20-30% range in running economy among age, gender and performance matched groups of trained distance runners. Therefore, it was only natural that deeper interest would go into the structural characteristics of running motion to explain differences in metabolic demand and performance. A paper by Weyand et.al showed that in 36 healthy subjects, the rate of force transfer (inverse of ground contact time) was strongly related to maximal aerobic power across a range of steady speeds on a treadmill. Regression analysis showed 98.5% of the within-subject variation in mass specific maximal aerobic power was accounted for by 1/tc. Santos-Concejero, linked to earlier, also showed ground contact variables as having strongest correlations to the poor economy in North African runners vs European counterparts. Similarly, Nummela et.al showed that ground contact time was the only stride variable showing significant correlation with both running economy and maximal running speed in young well-trained endurance athletes, but wasn't sufficient by itself to explain running economy in the most economical runners. Below is a graph showing the decrease in ground contact times (black dots) and aerial times (white dots) with increase in speed in Nummela's study. Again, correlation is not causation. But short contact time, according to the Nummela paper, seemed logically beneficial for both running economy and maximal running speed since the critical point in maximal sprint running and economical running is the speed lost during the braking phase of a run. A staple in engineering science, the mass spring elastic model came to fantastic help to analyze running motion. Several researchers have used the spring loaded inverted pendulum (SLIP) model (without damping) to accurately describe locomotion, whether that be trotting, hopping, or running, in a range of body sizes across 3 orders of magnitude. It turns out that whole-body center of-mass motion during running is similar to a pogo-stick (spring-mass) model where the leg can be represented effectively as a spring. So forget the complex neuromuscular stuff going on within the body. You can describe leg physiology quite nearly as the real thing with a linear spring model. A direct result of the linear spring is that the calculated work rate in the spring must equal the work rate in the center of mass. If the leg cannot be assumed as a linear spring, this equivalence is flawed. The mass specific work rate of the leg spring, Pspring or mechanical power output, is established as reciprocal of leg spring stiffness multiplied by the product of the square of spring force (F), step frequency (f) and body mass M.
The authors suggest that independent of low and high speed running regimes, method E is a simple and robust technique to estimate leg spring stiffness based on the spring model. In the low speed regime, a simpler calculation method such as A was found to suffice. Another point of contention arises with the assumption in the SLIP model that the foot's point of the contact with the ground does not move. In reality, this is not true. When humans walk or run they tend to make initial ground contact with the heel or the middle part of the foot, and then to roll the foot forwards and lift off from the toe. This moves the point of contact. 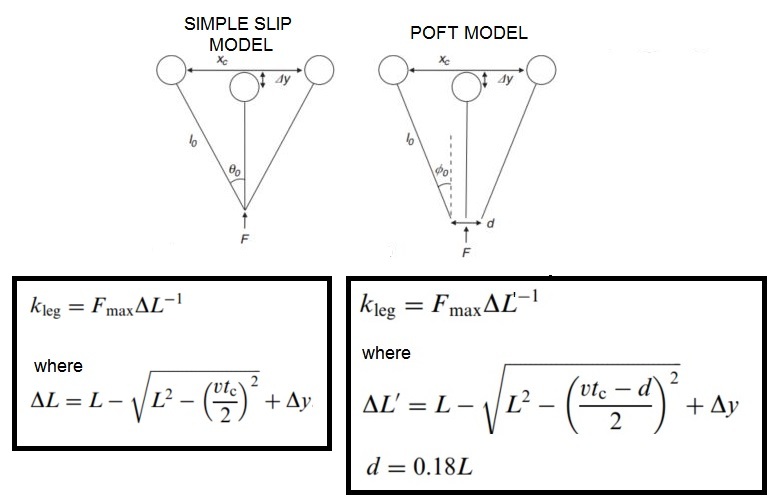 The SLIP model was modified with the point of force translation model (POFT) to portray this reality, first in this paper by Bullimore and associates. One words of caution. Different calculation techniques to estimate the compression of the leg while deriving leg spring stiffness can influence overall findings, sometimes even misguide. Papers written in the early 90's like this were stating that leg spring stiffness was observed to be constant across forward running speeds. Later, some papers like this one stated that leg spring stiffness could change dramatically with different stride frequencies at the same speed although leg spring stiffness was constant across running speeds. Most of these papers were using a calculation method advanced by McMahon and Cheng. Arampatzis et.al corrected that leg spring stiffness is influenced by running velocity and influenced by the increase in knee spring stiffness rather than ankle spring stiffness. They also stated that older methods such as those of McMahon and Cheng overestimated the change in leg length in the spring mass model causing leg spring stiffness to be constant across velocities. 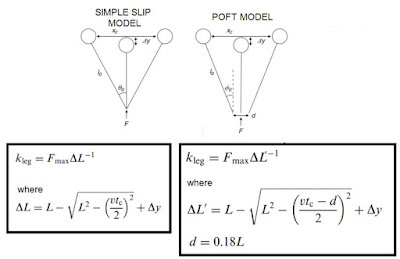 This extension of the SLIP model with active torque and damping is the simplest established model of legged locomotion that is capable of predicting the mechanical cost of transport. The reason is that by including damping in the leg, the analyst is able to account for the concept of stability in locomotive movement and isolate the non-zero energetic cost to ensure stable motion. A unique and recent paper written by two mechanical engineers from Purdue, which used the SLIP model with actuation, suggests that when non-dimensionalized for body weight and resting leg length, an optimum "relative leg spring stiffness" was selected by a running organism. This optimum corresponded to the minimize cost of transportation to the organism. Interestingly, Shen and Siepel found that with the SLIP actuation model, experimental values for leg stiffness in humans matched closely with the simulated relative leg stiffness corresponding to energy minima. That there could be one, or very narrow range of operational values for leg stiffness, over a range of speeds and leg landing angles is very interesting. This speed-independent biological preference for optimum leg stiffness also means that all animals prefer to stay somewhere in a narrow range of between 7 and 27 in relative leg stiffness. This is a new paper, therefore citations to the work are relatively low in number. The concept of an energy minima limited leg stiffness makes complete sense and I'm glad that engineers, using analysis tools in dynamical control systems, are lending a multi-disciplinary hand to the whole running biomechanics investigation. I effectively stop here in reading papers. The total volume of research in running biomechanics span decades and it is useful not to read every one but establish general principles that research provides. 1) First, that 1/tc, which is the rate of force transfer, is an important running parameter, which explains 70-90% of the energy cost is bipedal organisms. 2) Several factors affect running economy but generally it's been found that ground contact variables, such as tc, have stronger correlations with running economy and maximal speeds. 3) Simplistic linear relationship cannot explain everything going into the energy cost of running. For example, rate of force transfer, is not just related to speed but also factors like leg length. 4) The spring mass model is remarkably powerful to understand running dynamics, inspite of the neuromuscular complexity in the leg. But using incorrect equations to calculate leg spring characteristics result in misguided conclusions about it's relationship with speed. 5) Leg spring stiffness may or may not be trainable, although there is evidence that this parameter is a strong function of ground contact time. New research provides evidence of an energy minima limited leg stiffness value when normalized by body weight and resting leg length. 6) Research is in flux and what was believed 3 decades ago might not be true anymore. Interdisciplinary facets to investigations lend additional insight into the science of running, removing age old myths and misconceptions. It is important that I get to my own mini-investigations of what ground contact time and leg spring stiffness mean to me as a runner, which will be the subject of part 2.